It is said that “it comes with the territory.” That the deaths of family and friends occur with increasing frequency as you grow older. And it’s true. But there are some people who are so full of life, so full of accomplishment and promise unfulfilled that their passing is all that more difficult to accept. William S. Cleary was one of those people. He was also one of my closest friends. ‘The Surfing Guide to Southern California’, which Bill Cleary co-wrote with David Stern, is certainly what most people will associate with his name. The book was published in 1963 by another Topanga Beach friend, James `Fitz´ Fitzpatrick, and has been treasured by generations of surfers ever since. The 35th Anniversary Edition published in 1998 sold out and was reprinted in March of 2002. But that alone is not what made Bill special, or worth remembering. Bill was editor of Surfguide Magazine (1963-1965) and later served as associate editor of Surfer Magazine. 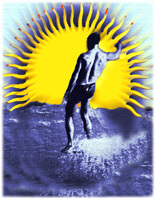 His book, “All The Young Wave Hunters” (New American Library -1967) is considered a classic in surfing fiction. He also was one of surfing’s early adventurers, exploring not only California’s west coast, but mainland Mexico, Baja, Central America, Hawaii, the South Pacific, New Zealand, Australia, France, Spain, Ireland, North Africa and even the Canary Islands - where Bill and George introduced surfing to the amazed islanders for the first time. While Bill will probably be best remembered for what he wrote about surfing and its unique culture, he was also one of the most accomplished surfers of his generation. His greatest legacy, however, was the intellectual integrity and style he introduced to surfing journalism and publishing. Up until then, words didn’t just take a back-seat to images in surfing magazines, what few words there were had little meaning or importance - let alone substance. As an excellent photographer in his own right, Bill already had a good sense of composition and design. As a writer, he knew about style. While editor of Surfguide Magazine he hired the best photographers, designers and writers he could find in order to established a dynamic relationship between all the creative elements that went into a magazine - words, images and overall design. Surfing magazines were no longer bastions of the mediocre and amateurish. A new age in surfing magazines had emerged and it was Bill’s vision that led the way. On a more personal level, Bill played a huge role in shaping my young adult life. He was like an older brother, my mentor and hero ... and I will always be grateful for his friendship, advice, patience and humor. We not only worked together, but shared some amazing surfing adventures, like driving down to Costa Rica and back in the early-seventies and exploring both coasts of New Zealand a couple of years later. But, like so many highly intelligent and talented individuals, he also had a dark side that strained and sometimes destroyed friendships - and I didn't communicate with Bill for almost twenty years. Then, after I was informed that Bill had Parkinson's by our mutual friend, David Stern, in 1996, I decided it was time to re-establish contact. Thanks to David I had Bill's current contact info and picked up the phone. The feeling was mutual. It was as if we'd still been in touch all that time and had last talked to each other just the day before. We exchanged emails almost daily and had long, rambling phone conversations - making up for lost time. Then, in July 1998 my wife and I were able to spend a week and a half in Santa Barbara and I caught up with Bill, his family and other friends & my sister, brother-in-law and nephew. It was a bitter/sweet visit because even though I was catching up with people I hadn't seen in years, I was also saying goodbye to my wonderful step-dad and to one of my dearest friends, Linda Kiewit. When we returned to NZ Bill continued to send me photos he'd played with in Photoshop and excerpts from the book he'd been working on. And I would send him feedback and the drafts of articles I was working on. In fact, we talked via email almost daily until the Parkinson's made it more and more difficult for him to use the keyboard. From then on we spoke on the phone every few weeks. By Christmas 2001 it was clear that Bill was having difficulty breathing and that he tired easily. But he was still confident that a newly developed surgical procedure he planned to undergo would be the breakthrough that would return him to full health. He was also excited about working on his book with old friend, George Van Noy, and hoping to see it published. When I spoke to him in late-June 2002, his breathing was very labored. While his part of the conversation started out quite lucid and optimistic, his thoughts began to wander. Several times I suggested that I call back later, but he'd immediately snap back into the present and insist that I stay on the line. This went on for another half an hour or so until I asked if he was still there. I could hear him talking, but not to me. After another ten minutes I hung up the phone. It was our last conversation. I understand that when Omar found him a moment later, Bill had a knowing smile on his face. He’d been battling Parkinson’s disease for 14 years and his heart just "gave out"
Bill Cleary is survived by his wife, Barbara, three children, Omar (32), Zoe (18) and Mariella (8), and two former wives, Lori and Mary - all of Santa Barbara. After our conversation, my wife, Anne, and I went down to the bay for a walk along the beach. I found the lower jaw bone from what looks like it might have been a small barracuda. It is perfect with rows of little teeth that I wouldn't want chomping on anything I own. Anyway, it was one of those kinds of walks. A shell here, a jawbone there. Then, just as we were about to return to the car Anne pointed out the beginning of a rainbow arching over our house on a hill in the distance. As we watched, the rainbow stretched from east to west, our house clearly visible beneath the dome. The colours were incredibly intense and made me think of the term, "all the colours in the rainbow." Only this one also featured several shades of purple and blue, separated by yellow. It was magical, especially since it hasn't been raining for three days and the sky was a clear, cold winter blue. I felt Bill in the rainbow and as I silently said my goodbyes it faded like smoke, leaving us to wonder if we'd imagined the entire thing. A memorial for Bill was held at the Santa Barbara Yacht Club on Friday July 19th, 2002. Click for link to more tributes and photos.